A HOWLER from Celtic goalkeeper Artur Boruc helped hand Hibs victory in a 2-0 win as Celtic surrendered their 12-game unbeaten run at Easter Road. 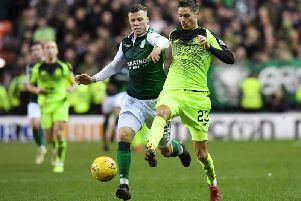 Hibs had experienced their fair share of goalkeeping calamities in recent times with the likes of Zibi Malkowski, Simon Brown and Yves Ma-Kalambay producing moments of madness to throw away points but this time an error was on their side. The goal which the Pole inexplicably let past him played a major role in ending Celtic’s winning run in the SPL. Hibs still had a lot to do after John Rankin’s long-range effort – which he later branded a “squiggler” – gave them the lead ten minutes into the second half, and they did it in style, claiming a second through Colin Nish and restricting Celtic to no more than a couple of on-target efforts. This was only Celtic’s second defeat of the league season, after losing to Rangers, and just the third game in which they had dropped points. Celtic had the bulk of possession in both halves but did not create many clear-cut openings and, while they kept pressing until the end, their attempted fightback looked uncharacteristically short of self-belief. Hibs, on the other hand, played with a composure which they had lacked against far weaker opposition. Crucially, they did not sit back too much after scoring the opening goal and were rewarded with a second. They benefited from good fortune at Rankin’s strike, but this win was the result of a disciplined all-round performance, and long before the end of the match Mixu Paatelainen’s side had the look of worthy winners. Hibs had the best chance of the first half, when Steven Fletcher picked up a long pass by Rankin and nicked it past Boruc on the edge of the box before shooting over. A wide shot by Paul Hartley and two efforts by Shaun Maloney – one saved, one blocked – were Celtic’s only notable scoring opportunities of that half. Maloney tried again two minutes into the second half, only to see his shot go wide, and then Rankin broke the deadlock with a magnificent strike. Taking up possession around 45 yards from goal, he let fly. Boruc thought he had read the flight of the ball, but when it swerved late he was unable to react, and Hibs were ahead. Makalambay did not have much to do as Celtic tried to get back on terms. With 25 minutes to play he tipped a Maloney shot over the bar, but otherwise was content to let his defence clear most of the danger. As Celtic committed more men further forward, Hibs were able to mount the odd counter-attack, and from one of them they scored their second. Fletcher put O’Brien through on the left of the penalty area. The winger got round Boruc, but he was too close to the byline to shoot. Instead, he crossed to Rankin, whose shot was turned into the net from a few yards out by Nish. The win lifted Hibs to fifth and meant they had gone four games without defeat. Hibs: Ma-Kalambay, van Zanten, Hogg, Jones, Murray, Thicot (Chisholm 85), Bamba, Rankin, O’Brien (Stevenson 82), Nish, Fletcher. Unsed: McNeil, Riordan, Yantorno, Pinau, Campbell. Celtic: Boruc, Hinkel, Caldwell, McManus, Wilson, Loovens, Scott Brown, Hartley (McGeady 71), Maloney, Sheridan (Samaras 56), McDonald. Unused: Mark Brown, Nakamura, Mizuno, O’Dea, Caddis.